It’s my theory that people are particularly motivated to make career changes around this time of year, as the essence of change is already in the air – weather is changing, seasons are changing, and as such our habits and wardrobes are changing. Even moods tend to shift. 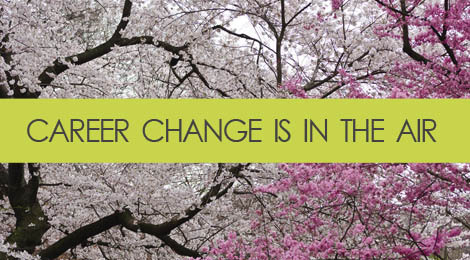 Change takes on a more positive connotation under these favorable circumstances. I love change. Not so much on a personal level, but more so working with others to reinvent themselves through exciting new career ventures. It’s really my sweet spot – career transition – as a writer, a strategist, and a glass-half-full kinda gal. But it’s challenging, and I hear that frustration coming through loud and clear from my clients as they struggle initially with where to go next, where to begin that transition, and in developing the confidence needed to solidify that decision. In this situation, you know that you’re passionate about working within a particular industry or company type, but you don’t know how to reposition your skills to break in, or what kind of role would be available to you there. The “Initiative” is all about who they are as an organization, what they’re doing, and why that appeals to you on a personal level. A good example would be someone who has worked 15 years in finance for large Wall Street corporations, but has found she’s really drawn to the creativity and innovation that comes along with working for a socially-responsible startup. She knows it would be hard to break in as a director-level finance professional at such a small organization, but perhaps there’s a way to repurpose her wide range of financial and client services skills to a different type of role that would achieve her bigger goal of breaking into that environment. It’s less about the exact specifications of the role, and more about how the organization and the type of work they do align with your own personal values and interests. Flexibility works well in this situation, as often times you might be faced with breaking in at a lower rank or salary level to compensate for a lack of hands-on or industry experience. What are willing to work for, and if you do scale back, what’s the alternative payoff you’re receiving in being able to work someone you truly love? What kind of growth potential exists for you? Being willing to start at a lower salary is great, but the novelty will eventually wear off, and you’ll be faced with decisions about where you want to grow. Are you thinking beyond just the point of breaking in and thinking about where you might want to be 5 years down the road? From this perspective, you have a fairly defined idea of what kind of work and position you’re targeting, and are focused on repurposing your skills from a different career path to fit that new role. This is more about the specifications of the position, and perhaps less about the environment. You have a passion for doing X type work, and are willing to go where that opportunity lies. An example would someone who formerly pursued a career in sales, but has always been passionate and interested in working within graphic design. This isn’t always an easy jump, as it’s heavily skill and experience based. But it is about looking at your transferrable skills and where you can apply them in a different functionality. A good sales person typically has excellent relationship building, communication, and client management skills, all things that would be important for a designer who interfaces regularly with a multitude of diverse customers and team members, and whose job it is to sell ideas from a visual perspective. You know what you want to do next – do you have all the necessary skill sets to be able to succeed in that role, and if not, what resources are available to you to bridge that gap? Clarity is key here – what specific skills do you bring to the table, and how will they benefit you and the organization in your new focus? The idea of transferrable skills can be vague and unappealing to hiring managers, so it’s important to be able to illustrate exactly how your “leadership” skills will position you for success in the job. What additional personal and professional attributes do you bring to the table that would set you apart from someone with a more traditional background and hands-on experience in that type of position? Maybe you have experience delivering presentations in front of C-Level executives, and your more reserved creative counterparts do not; don’t be afraid to talk about examples of how that’s helped you win business and deliver value to the organization in your cover letter, resume and interview. Remember, both scenarios are heavily focused on transferrable skills, and it’s important to be clear on what those top transferrable skills are that you bring to the table, and why they’re of value. At the end of the day, no matter where you’re coming from or where you’re trying to go, the biggest challenge you face is convincing hiring managers that the transition will be a seamless one, and making a compelling argument around that based on your past accomplishments and results. Tags: career, career change, frustrations, marketing, transition. Bookmark the permalink.